Santee 11-year-old Jaydin Wenck was among the 75 BMX riders who took part in this year’s Olympic Day festivities held June 29 at the Chula Vista Olympic Training Center, an expansive 155-acre facility overlooking Lower Otay Reservoir. Olympic Day is celebrated in more than 160 countries commemorating the birth of the modern Olympic Games, and is an international effort to promote fitness and well-being besides the Olympic ideals of fair play, perseverance, respect and sportsmanship. Three Olympians took part in the BMX event: Australia’s Sam Willoughby (silver medalist at the 2012 London Games) and Brian Kirkham (2012 Australian national champion) and American Alise Post (2012 USA Cycling BMX Elite national champion). Willoughby brought along his Olympic silver medal to show excited kids. “It’s definitely a plus whenever you can get support from the BMX community,” said BMX development track operator Tyler Brown, a 2010 resident athlete at the OTC. The guest celebrity of the day, however, turned out to be Wenck, who is ranked third nationally in her age group. She will compete in the USA BMX Las Vegas Nationals Friday through Sunday, July 12-14 (held indoors at the South Point Hotel and Casino). Wenck easily zoomed ahead of the boys to win her heat at the Olympic Day event. 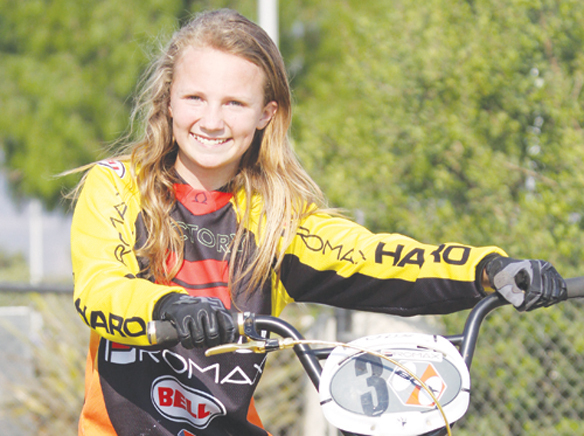 She has been involved in BMX racing since she was four-and-a-half years old. 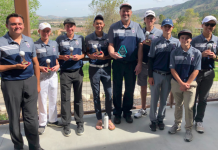 The OTC youth development track underwent a full rebuild in late March and early April to elevate it one of the top tracks in the country, according to Brown. Riders from all parts of San Diego County can take part in programs offered on site. The track, which is located adjacent to the visitors center (and nearby BMX Hall of Fame), is open to the public on a weekly basis, with practices scheduled on Tuesday, clinics on Thursday and racing on Saturday. Tuesday’s schedule includes pro practice is from 4:30 to 5:30 p.m., followed by open practice from 5:30 to 7 p.m.
Thursday’s clinics include those for beginners (5 to 6 p.m.) and advanced riders (6 to 7 p.m.). On Saturday, sign-ups are taken from 2:30 to 4 p.m., with racing to start as soon as possible afterward. “This is a great track where the world’s best riders come out to train and end up riding with the brand-new beginner kids,” Brown said. Chula Vista BMX will host a summer camp July 16 to 20. Sessions include either all-day or afternoon time slots. As far as upcoming competitions, next up at the track is the Race for Life, a fundraiser for The Leukemia and Lymphoma Society, on July 20. The BMX competition in this year’s California State Games is scheduled July 27. The OTC track will host the Hall of Fame Nationals Sept. 27-29 during which the UCI Supercross tour will also make a stop at the facility’s Olympic-replica track.